I present to you… the trashiest of the sweet potatoes. It’s like every single thing I love just threw up all over my whipped sweet potatoes. I mean, seriously. I don’t think we are missing A THING! Exclamation points. Last weekend I kind of made the Thanksgiving meal of my dreams. I say dreams because here’s the thing: I really, really love the traditional Thanksgiving dinner. I mean, LOVE it. I am all for adding new things but don’t you dare swap something from my table. I pretty much have a heart attack. My mom, on the other hand, doesn’t really feel the same way I do and would prefer no new additions. Just our good old-fashioned meal. A few years ago I took butternut squash lasagna and she practically made me sit under the table. She also didn’t even take a bite. It’s cool though. She makes the best turkey, stuffing, mashed potatoes and gravy ever. It actually scares me because when the day comes that I have to make Thanksgiving dinner, everyone will probably hate my guts because I’ll force new twists (!) and modern dishes (!) upon them. SO that’s why I did this. I smoked a turkey and made us a bunch of crazy side dishes that sounded completely incredible on their own with no intentions of combining the whole shebang as a meal. And THEN! I realized that we had to eat dinner and that I practically had every Thanksgiving dish in my kitchen and we were going to eat them together. I was nervous. It totally worked though. Somehow everything just flowed together and complimented each other. I’m not sure if I just got lucky or if I use so many of the same ingredients in my simple world that the undertones of every dish weren’t entirely different. OR maybe I just kind of know what I’m doing by now but I’m not banking on that option. I still have no idea what I’m doing. I mean I had to call my mom and ask her how to buy a turkey. I am a child. The catch is that while everything was delightful… I am glad it won’t be the actual meal on Thanksgiving. Does that make sense? On that day, I just like everything to taste like… home. Like nostalgia. Like childhood. Like my non-cynical, naïve days. In other words, not like bourbon and brown butter and sage. The bacon can stay. Oh and in case your eyes are deceiving you, this is one heck of an indulgent side dish. 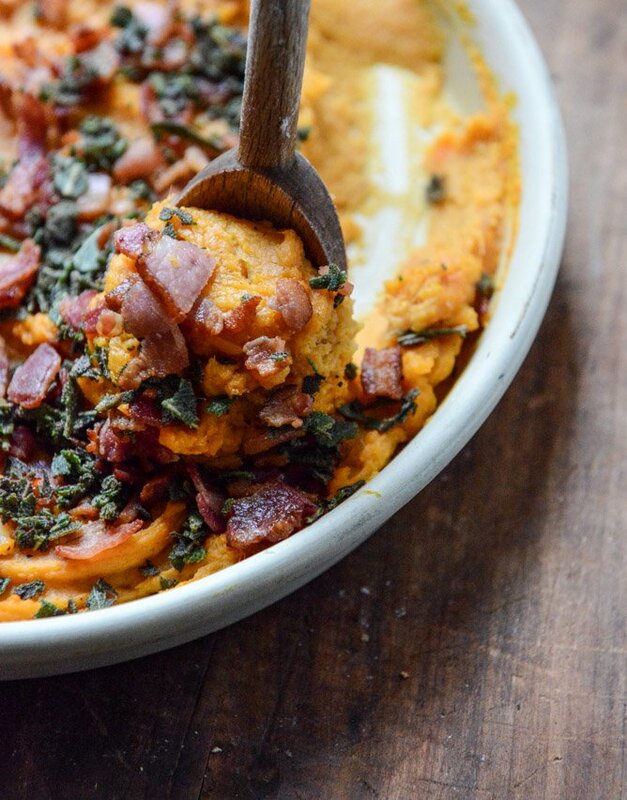 If you’re looking for a healthier alternate, try this lightened up sweet potato casserole I made a few years ago. It’s what I will make a few Thursdays from now and it is so flipping good. If you’re looking to vary your flavors a bit, make this version. Or heck, make this version tonight for dinner tonight. It’s a perfect side dish for grilled chicken and steak. We have been eating it alllllllll week and actually… I’m not sure if there is anything it DOESN’T go with. It’s sorta heaven in a bowl. If bourbon isn’t your thing, simply leave it out. If you’re making this for children, don’t ask my opinion because not only do I not have kids, my mom let us all eat that old-school fruit dip made with rum back in the day and I’m sure that sometimes I used a spoon when she wasn’t looking. Pretty sure I turned out okay. But that’s debatable… I guess. Add the potato chunks to a large pot and cover with cold water. Bring the potatoes to a boil and cook until they are fork tender, about 20 to 30 minutes. While the potatoes are boiling, heat a large skillet over medium-low heat and add the chopped bacon. You have 2 options here: you can cook the bacon until it is totally crispy or you can cook it about 3/4 of the way, so the fat has rendered, and then pop the dish in the oven and let the bacon finish crisping up there. Either way, you want all of the fat to be cooked out. Remove the bacon with a slotted spoon and place it on a paper towel to drain. Remove about 1 tablespoon of bacon fat from the skillet and set it aside in a bowl. To the same skillet, add the butter and heat it over medium heat. Add the sage leaves and cook until they are crispy, about 1 to 2 minutes per side. Remove them with a slotted spoon and place on a paper towel to drain. At this point, the potatoes are most likely finished, so drain the thoroughly and add them back to the pot. Mash them with a fork or potato masher, then use a whisk or electric hand mixer to whip them. Once whipped, add in the reserved bacon fat, the milk, the bourbon and the brown butter. Whip the potatoes again until everything is combined. Taste the potatoes and add the salt and pepper, seasoning more or less if desired. If serving the potatoes immediately, spread them in a dish and top them with the crispy bacon. Crumble the sage on top. If you’re waiting a bit to serve them, heat the oven to 325 degrees F and top the potatoes with the bacon. Bake them for 25 to 30 minutes, then remove them from the oven and crumble the sage over top. Pingback: Trying A New Recipe This Thanksgiving? In The Spirit Of Nora Ephron, Share Your Photos! Oh my gosh – all the best things! I added 4 tbsp butter to the bacon fat and browned it there while cooking the sage. Then I added all the bacon fat and brown butter together to the potatoes – yummmmmmmmmmmmmm. Can I make these a day in advance omitting the sage and bacon and then top and bake the next day? If I cook these the night before, what would be a good reheat cook time and temp? Do you think I can make this the night before Thanksgiving and pop it in the oven before serving? hi! you totally can – only issue that the bacon will not be crispy! no big deal, just depends on your preference. I did the bacon and sage the night before; drained them and then added them to the potatoes the afternoon of Thanksgiving. Amazing!! What could I use instead of cream? Non dairy option. This looks so good and I’m sure it wouldn’t be the same without the cream. I just made this for my tomorrow. I added crushed pepper am also topping it with candied walnuts because why not? Omg they have this in Orlando at Downtown Disney. It is incredible. I can’t believe I found a recipe for it. I am always busy. I’m self employed. I have a gutter cleaning service. When it’s time to relax, I like to cook. Thank you so Mich for posting this. OMG…. These are flippin’ amazing!! I do NOT like the overly sticky sweet sweet potatoes; these are wonderful. Our guests raved and so did I!! Amazing how sweet they are with no sweetening added. Next time I will chop the bacon a little coarser, but over all, a real “keeper”! I’ve made this recipe for Thanksgiving for the past three years, and it gets rave reviews every time. I’ve been asked to bring it to Christmas dinner, this year, too. I usually make it ahead and then reheat it on Thanksgiving after taking the turkey out, and it comes out great every time.